Water each zone for three minutes. Measure the amount of water in each can. Add the amounts in each can and divide by the total to obtain an average. Multiply the average by 4 to determine how long to run the system. For example, if you found that the average in a particular station is 1/2", then you would water for 6 minutes to apply 1 inch of water. If you find great variations in the amount of water in various cans, then have your sprinkler system checked. Most experts recommend at least one inch of water a week to maintain an existing landscape. However, more water may be required with recent high temperatures. The long drought has finally hit most residents of North Texas cities in their own back yards: mandatory outside watering restrictions are in place. We have found five ideas for limiting outside water use and still maintaining an attractive landscape with plenty of curb appeal. Avoid runoff on sloping areas by cycling the water off and on. Apply water slowly for five to fifteen minutes and then turn it off for fifteen minutes. Repeat until you have watered the correct amount. This process is particularly helpful for those who are unlucky enough to live on lots composed of clay soil. Consider using low output sprinkler heads, bubbles, or drip irrigation systems as tools to avoid runoff. When replacing plants or trees that have died because of this summer's hot temperatures and lack of water, consider replanting with drought-tolerant plants and shrubs. A blooming Mexican heather outperforms a drooping azalea in almost every category. As an added bonus, native plants can provide food for wildlife. Consider using groundcover rather than turf, especially on oddly-shaped areas. It's easier to maintain, requires less water, and will avoid runoff. Again, to those unlucky owners of clay: consider adding organic material to your clay soil at every opportunity. You'll use less water, and your landscape plantings will perform better. Evaluate your sprinkler system. The next post will include instructions for determining how much water your sprinkler system is delivering. Use those numbers to decide how long to water. Following these tips will assist you in saving money and your expensive landscape. American Leak Detection provides a step by step test to find out if your pool is leaking or if the water is evaporating at a faster than normal rate because of the heat. Fill the pool to the level recommended for operating: usually pool companies suggest halfway up the pool skimmer. Turn off the pool pump and any other device that adds water to the pool. Take a five gallon bucket and fill it to within 1" of the top. Place the filled bucket on the 1st or 2nd step of the pool with the bucket under water at least six inches. Make sure the bucket won't tip or float. Mark the water level on the outside of the bucket. Turn the pool pump back on. You won't be able to swim during the test. Wait 24 hours and compare the level in the bucket with the level in the pool. If the pool level is lower than the bucket level, then you probably have a leak. If the levels are the same, then the Texas heat has struck again, and you are experiencing normal evaporation. Those pools with a spa, fountain, waterfall, or negative edge will lose slightly more than the bucket because of increased evaporation. Thanks again to American Leak Detection. If you do have a leak, you might give them a call for advice and service at 817-789-4571 or 972-441-4030. Truly a home for a lifetime, this immaculate home has been meticulously maintained. The 4 bedroom plan features a separate secondary bedroom with a private bath. The dream kitchen boasts ample cabinet & counter space, Corian tops, island, smooth cooktop, & built-in desk. Other features:Private master ste (2 closets) & luxurious bath, Plantation shutters, radiant barrier, crown molding, solar screens, epoxy garage floor.Don't miss the 3 car garage! Call the Grove Team, Keller Williams Realty today to schedule your private tour today - (817) 337-0000, www.groveteam.com. The latest ratings from the TEA have been released, and Keller ISD's rating has fallen to Acceptable from Recognized. Naturally, all residents of KISD are concerned about a ratings fall. Those with children and those who are concerned about children wonder about the effectiveness of education in the district. Even those without children are concerned about falling property values because of school quality. A quick look at the ratings of various campuses demonstrates the problem. Although some campuses did have lesser ratings this year, Caprock Elementary fell from Exemplary--the highest rating--to Unacceptable. Falling from the highest rating to the lowest in one year is an unusual development, to say the least. Brice Nieman from KISD shed some light on these new developments. The rating change for Caprock seems to be directly linked to a change by the TEA. The TEA did use the Texas Projection Measure in 2010, and the scores from all sub-populations were not used to establish Caprock's rating in 2010. In 2011, those two factors were reversed: the Texas Projection Measure was not used and scores from all sub-populations were used. These and other changes to the rating system made achieving higher ratings more difficult in 2011 than in 2010. Rating changes--mostly downward--were not unusual for Texas school districts and for individual campuses in 2011. Caprock Elementary's fall is unusual in how far it fell in a single year. Keller ISD is working to improve its campuses this year. The question is how much time will be spent on teaching to the test because of the furor over the ratings change. *June number from National Association of Realtors. On an anecdotal basis, the Grove Team received five offers on different properties in various price ranges over the past weekend. That many offers is respectable in any market. Other agents we have spoken to also have reported similar levels of activity. We can't allow ourselves to be a part of a gloomy outlook that becomes a self-fulfilling prophecy. Thanks to Sandy Shetty at Benchmark Mortgage for assembling the data above. (ARA) - A surprise can be fun on some occasions, like your birthday. But when it comes to home repair emergencies, a surprise is the last thing you want - especially in these economically challenging times. Unfortunately, this is a situation all too many homeowners find themselves in after a home emergency. Often they discover that a repair they assumed would be covered by their home insurance or local utility is actually their responsibility to fix. From water and drainage systems to electrical and heating/cooling configurations, your home is a complex network of pipes, wires and electrical components that could require an emergency repair at any time. An outside water pipe breaking or a sewer line collapsing can easily rank as a homeowners' worst nightmare; however, when an emergency occurs, most homeowners are not aware of who is responsible for the damage. In fact, less than 50 percent of the homeowners in a recent national survey, conducted by GfK Roper Custom Research, knew that they were responsible for repairs to the water line between their house and the street. This is where companies that offer emergency home repair plans, such as HomeServe USA, can make the difference between peace of mind and an expensive and time-consuming repair. "According the results of the survey, one third of all homeowners responding assumed that their local utility was responsible for the cost of a burst water line between their house and the street, when this is usually not the case," says Tom Rusin, chief executive officer of HomeServe USA. "One of the challenges of home ownership is that the potential for expensive repairs is always out there. In fact, repairing a water service line can cost more than $2,000 and simply clearing a blocked drain can cost upwards of $350." 1. Speak to your homeowners insurance agent to get a clear understanding of which areas of your home are covered by your insurance policy and which ones are not. Potential trouble spots include interior and exterior electrical wiring, outside water service and sewer lines, inside plumbing and gas piping, central heating and air conditioning systems, and the water heater. 2. Similarly, speak to your local electric, gas, and water utilities to determine equipment that you may be responsible for. As mentioned earlier, the water and sewer lines that run underneath the lawn are the responsibility of the homeowner in the vast majority of cases. 3. Proper maintenance of home components greatly minimizes the chance of an unexpected emergency. For example, check the air filter on your central heating or cooling system regularly and change it about once every three months during the season. Protect water pipes from freezing with proper insulation or draining them prior to winter. And fix leaky faucets and toilets to save water and prevent bigger problems. 4. Consider a home emergency protection plan that can relieve you of not only the financial burden of a home emergency, but also the uncertainty involved in looking for a repair person on a Sunday afternoon. "The more prepared homeowners are for a home repair emergency, the more peace of mind they'll have and the more time they can spend enjoying their house with their families," says Rusin. Looking for a secluded property with a pool and room to run? Come visit us this weekend in the Jewell Estates at 6612 Emerald in Colleyville. Thank you Sandy Shetty, Benchmark Mortgage for this awesome information today! For your mortgage questions, call Sandy Shetty direct (817)966-9446. The Obama administration will begin working on new strategies for how to better sell previously foreclosed homes held by Fannie Mae, Freddie Mac and the Federal Housing Administration, which may include renting more REO. The Federal Housing Finance Agency, the Treasury Department and the Department of Housing and Urban Development put out a request for information, seeking new ideas from market participants for selling REO. Currently, the government owns roughly half of the REO inventory in the U.S. The agencies called on private property managers to submit ideas on how to reduce the REO portfolios at the GSEs and the FHA in a cost-effective manner. They also seek new ideas on property repair, sales strategies in specific hard-hit areas and new analysis of when to sell or even rent these properties. There are 92,000 properties currently for sale from HUD, Fannie and Freddie. Inventory is different as many properties are held up and not currently on the market due to delays in the process or state and federal regulations. Fannie Mae held 135,719 REO properties at the end of the second quarter, and Freddie held an inventory of roughly 61,000 REO. The agencies said there could be new programs developed for allowing the previous owner to rent the home or to allow current renters to become owners. They are also looking for private holders of REO to partner with the government in the effort. Sen. Jack Reed (D-R.I.) recently sent a letter to the FHFA, urging the Fannie and Freddie to convert their repossessed properties into rental units and pool them for sales to investors. "FHFA, Treasury and HUD anticipate respondents may best address these objectives through REO to rental structures, but respondents are encouraged to propose strategies they believe best accomplish the objectives," the agencies said. FHFA Acting Director Edward DeMarco said Fannie and Freddie will continue marketing individual REO for sale, but they will also look at possibly pooling these properties in some areas to reduce credit losses and stabilize neighborhoods. "Partnerships involving enterprise properties may reduce taxpayer losses and meet the enterprises’ responsibility to bring stability and liquidity to housing markets. We seek input on these important questions," DeMarco said. Treasury Secretary Timothy Geithner said solving glut of REO on the market is crucial to repairing housing finance overall. "Exploring new options for selling these foreclosed properties will help expand access to affordable rental housing, promote private investment in local housing markets, and support neighborhood and home price stability," Geithner said. HUD Secretary Shaun Donovan said millions of families, who have struggled to maintain their monthly payments, have seen the value of their home drop because of abandoned properties. "At the same time, with half of all renters spending more than a third of their income on housing and a quarter spending more than half, we have to find and promote new ways to alleviate the strain on the affordable rental market," Donovan said. "Taking steps to encourage private investment in REO properties and transition them into productive use will help stabilize neighborhoods and home values at a critical time for our economy." Interesting story which recently appeared in the Wall Street Journal regarding Colby Sambrotto, the founder and former CEO of forsalebyowner.com. It seems the founding father and lifelong evangelist of the concept of selling your home without a real estate agent was forced to hire a broker to sell his home after failing at what he preaches others should do. Have you tried to sell your home For Sale by Owner and not had the luck you had hoped for? Call the Grove Team, Keller Williams to meet with you to discuss the current market trends and how our team of local real estate experts are here to help you make your next move easier. (ARA) - Buying a home is more than numbers, dollars and cents. The pride of owning your own home is an incredible feeling, providing a place for you and your family to come together and build memories. For many, getting through the process of buying a home can be daunting, if not downright frightening. Talk to anyone considering buying a home for the first time, and many will say the same thing: "There's so much information - I don't know where to start or where to turn for answers. It's overwhelming." With all the potential pitfalls out there, it's key to arm yourself with the right tools to help you navigate the intricacies of the home buying process. Getting the right information and help along the way will make this milestone purchase easier and hassle-free. While partnering with a real estate agent and knowledgeable mortgage lender will go a long way towards home buying success, empowering yourself is also important. You are not alone, but you're also your own best advocate. Learn about the neighborhoods where you might want to live, and think about your day-to-day lifestyle when deciding what area - and type of home -is right for you. Take a home buyer education course - they're often free and will help prepare you for the home buying process. The U.S. Department of Housing (www.hud.gov), NeighborWorks America (www.nw.org), and the National Foundation for Credit Counseling (www.nfcc.org) are all great resources for further education on buying a home. Or you can check with your bank - some, like TD Bank, offer sites that provide one-stop shop info on buying your first home. Partnering with a real estate agent can help make the process of buying your first home more efficient and hassle-free. A real estate professional will help you assess your needs and wants in a home, and then utilize that information to narrow the field of available homes in your price range to a manageable pool. Well-versed in the local area, a real estate professional can help ensure you're getting a better price, will negotiate on your behalf, and can protect your rights as a homebuyer. Your agent also may be able to make mortgage lender recommendations. Like buying a home, choosing a mortgage provider is about more than terms and rates - it's about finding a company that has the knowledge to help you succeed. "Find a lender who is also your financial partner," says Mike Copley, executive vice president, retail lending at TD Bank. "Your mortgage advisor should work with you to find the borrowing solution that's right for you, and make the experience as straightforward and hassle-free as possible. Your lender's commitment to you shouldn't end with the closing of your loan." Some things to consider when selecting a mortgage lender: Will I be supported from application to closing - and beyond? Are there application fees? How quickly will I have a decision on my application? What type of mortgage should I choose? Does my mortgage provider service their own loans, or can they be sold to another institution later? Does my mortgage provider have a strong customer service focus, so I can ensure my needs are being met? The answers to these questions will help you forge the right partnership with the right mortgage lender. There's nothing to fear about buying your first home if you're an educated consumer who finds the right real estate and mortgage team to help you make your dreams come true. So get out there and find your dream home! Are you ready to get started with your home purchase? Call the Grove Team, Keller Williams Realty to schedule your meeting with a Buyer Specialist to work with you through each step of the process. Visit our website to Meet the Team or call us, (817) 337-0000. RISMEDIA, July 14, 2011—Economic consulting firm Clear Capital reported prices nationally have decreased by 3.2 percent in the first six months of 2011 and are forecast to drop another 2.4 percent in the second half of 2011. The new forecast updates the firm’s December prediction that prices would fall 3.7 percent in all of 2011 after falling 4.1 percent in 2010, the firm reported recently. But individual markets will vary widely. In the second quarter home prices gained 0.9 percent after nine months of decline. Halfway through 2011, the U.S. REO saturation rate remains at 31.3 percent compared to the 33.1 percent reported at the end of Q1. This number, while historically very high, is clearly trending slightly downward with absorption of REO property. Only five U.S. markets are forecast to produce home price gains in the second half of 2011 including: Washington, D.C., New York, Orlando, Dallas, and San Francisco. “At the mid-point of the year, it’s promising to see the overall market shake off the string of declines observed since late last year, especially in light of significant challenges for the industry,” says Dr. Alex Villacorta, director of research and analytics at Clear Capital. “However, we have yet to see the burst in consumer demand to avoid posting a net loss in national prices for the year. “While most individual markets are also projected to post losses for the year, it is clear prices have begun to level off and are not exhibiting as much volatility as we’ve seen since the downturn began,” adds Villacorta. The first half of 2011 continued the price declines experienced across much of the U.S. in 2010 as prices continued to face pressure from high unemployment and REO saturation rates above 31 percent. Home prices for the first half of this year have also been affected by a reversal of price gains from the 2009 and 2010 homebuyer tax credits. The wild spikes in price trends experienced in 2010 have given way to more gradual trends in 2011. Declines of 3.2 percent through the first half of 2011 contributed to the overall 8.0 percent decline since June 2010. Prices were also pushed downward 4.1 percent in the first quarter of 2011 due to the slow winter home buying season creating the “double dip” in April 2011, and breaking through the previous low mark set in Q1 2009. Since then, U.S. price declines have seen modest gains, and while varying according to each local market, it is unlikely national home prices have reached a true and sustainable bottom. The future outlook continues to point to a fragile housing market. However, the aforementioned quarterly increase of 0.9 percent is an encouraging sign that the markets are capable of positive price growth despite the first quarter lows and the continued economic and foreclosure pressures. Even with the recent gain in quarterly home prices, current price levels effectively match the levels seen in Q1 2009, and hover near the levels last seen in mid 2000. For more information, please visit www.realestateeconomywatch.com. Another quality renovation from TK Homes! The beautiful home located in Hurst offers a new HVAC, new flooring, fixtures, appliances, granite in the kitchen AND baths, and a new roof. This one story home features four bedrooms, three bathrooms and an awesome lot. Your own private retreat in the heart of the city! Situated on an acre wooded lot, this home offers something for everyone. Featuring three separate living areas all on one level, four bedrooms, three and a half baths, a study and two garages - an attached three car and detached two car. Included on the acre lot is a pool and spa-great for entertaining and lots of room to run. 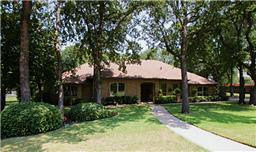 Updated throughout, including granite counter tops, premium appliances, and remodeled baths. So much to mention you just have to see it to believe it! Call the Grove Team, Keller Williams today to schedule your private showing, (817) 337-0000.